This past week was such an emotionally difficult one with the passing of my dear friend, Delia Young. To the rescue were our dear friends who moved from Kansas City to the Detroit, Michigan area a couple of years ago! Ramon and I stepped on a plane bound for Michigan on Friday morning…no small feat as I am terrified of flying. There was no way, however, I would have missed out on visiting with our very special and incredibly gracious hosts…even if it meant I had to fly to get there! The special treatment started at the front entry of their lovely lakeside home (above). It just got more and more special as we were treated to an inspired tablescape created by our hostess, Rene, to herald our arrival and declare the team spirit that runs deep. 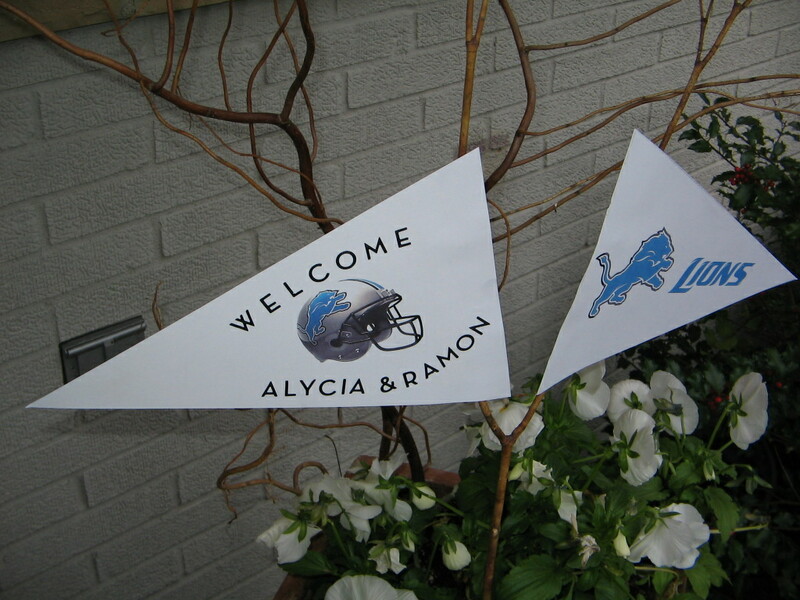 Rene put her creativity to work to put together this incredible tablescape to get Ramon and me into the Lions spirit for the Sunday game! 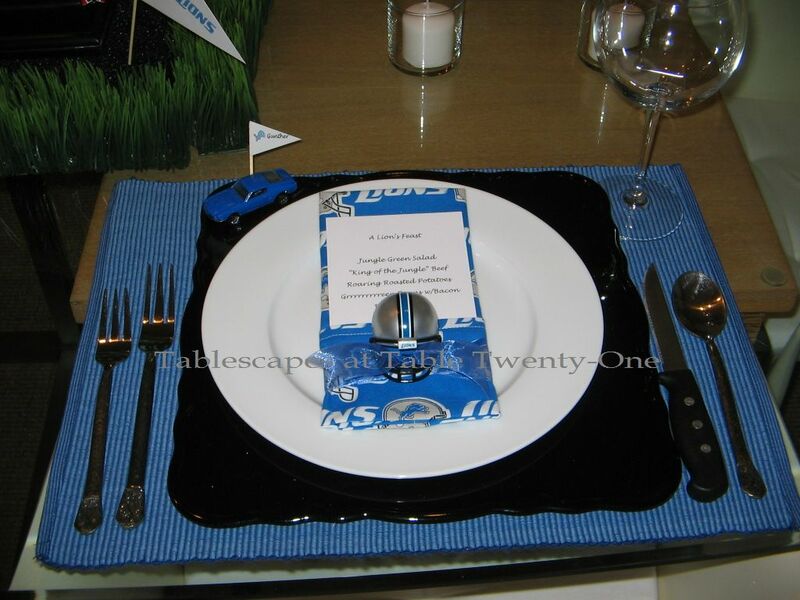 The team colors of Honolulu blue, silver, black and white were all incorporated into the imaginative place settings with the placemats, team napkins and helmets, and chargers. 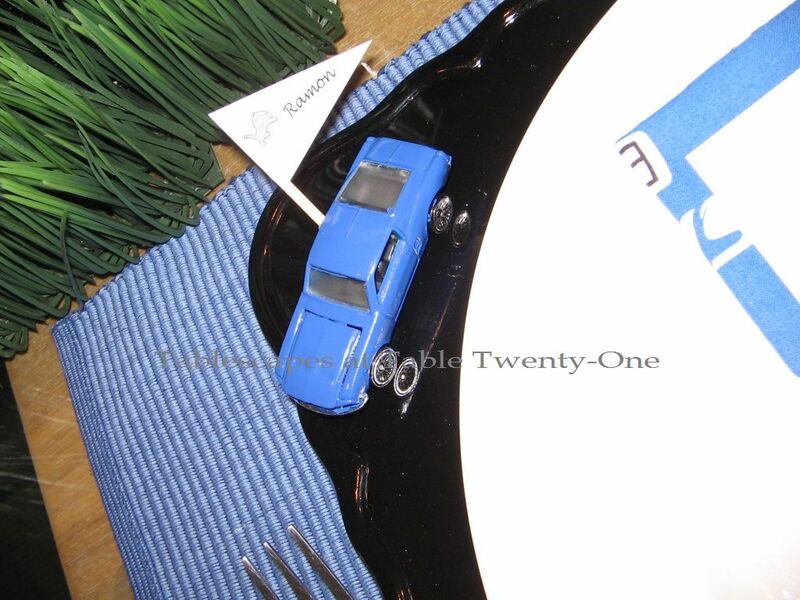 The cute miniature cars pay homage to both the Ford Motor Company which is headquartered in Dearborn, a suburb of Detroit, Michigan, AND to my sweet hubby who is a plant doctor at the Ford Assembly Plant in Missouri. 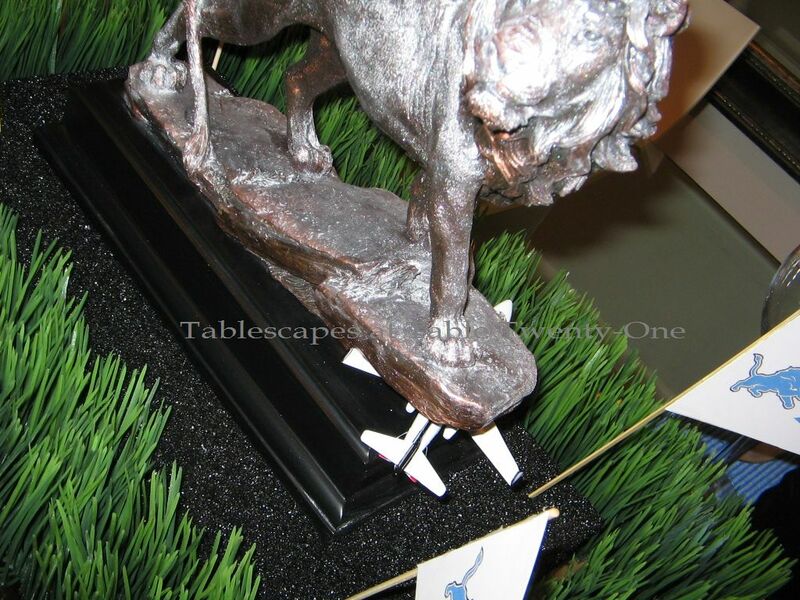 Rene thought of absolutely everything when putting this tablescape together, including this hilarious depiction of the Lions crushing the New York Jets!!! 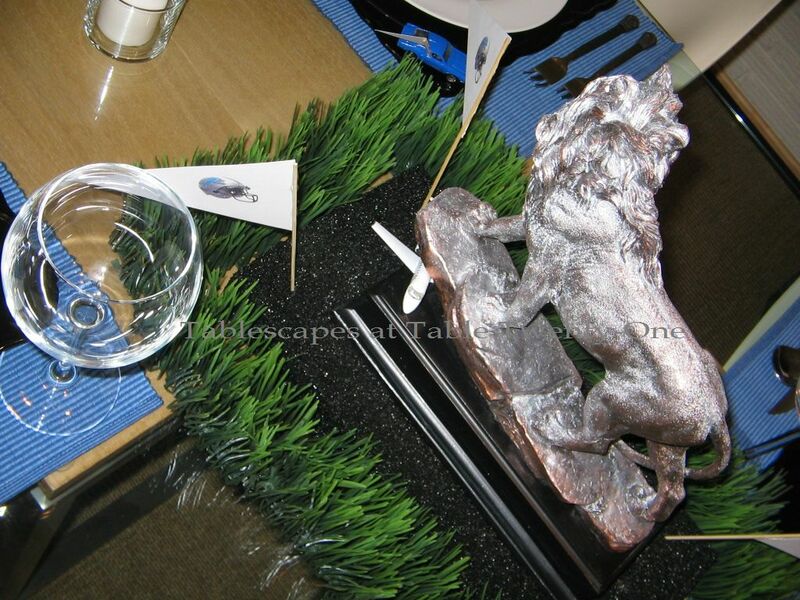 She and her imaginative friend, Karen, conspired to create the ultimate centerpiece with this bronze-come-silver lion. They actually came up with the brilliant idea to dust the bronze lion with silver cake dust to sync with the Lions’ official colors!!! Is that not the greatest??!?!?!! Rene thought of everything! 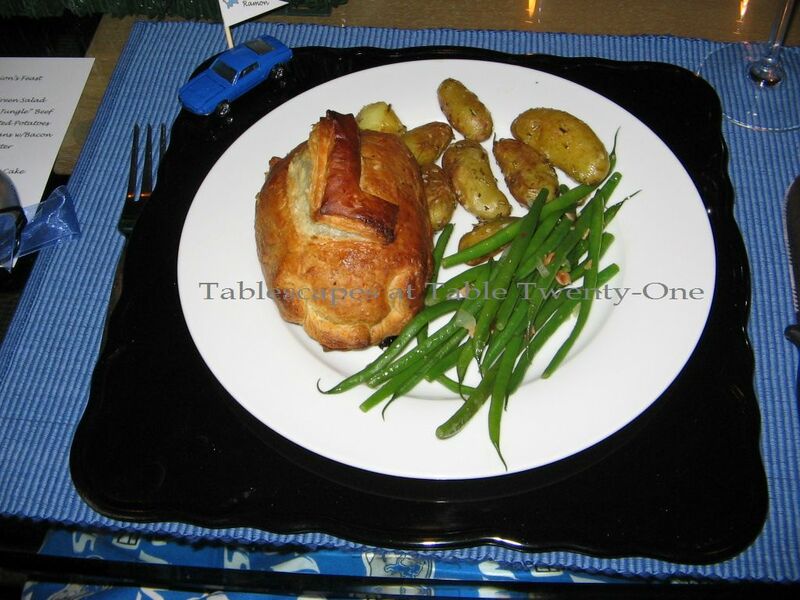 The Beef Wellington even had a puff pastry “L” for Lions on it! (This was her first attempt at Beef Wellington, but had I not seen her prepare it with my own eyes, I would have sworn it was catered! Magnificent!!!) For the record, I officially gained 4 pounds from Rene’s wonderful cooking over the three days we were there! Our lovely and very thoughtful hostess surveys her handiwork. Ramon and I are still staunch Kansas City Chiefs fans (forever!!! 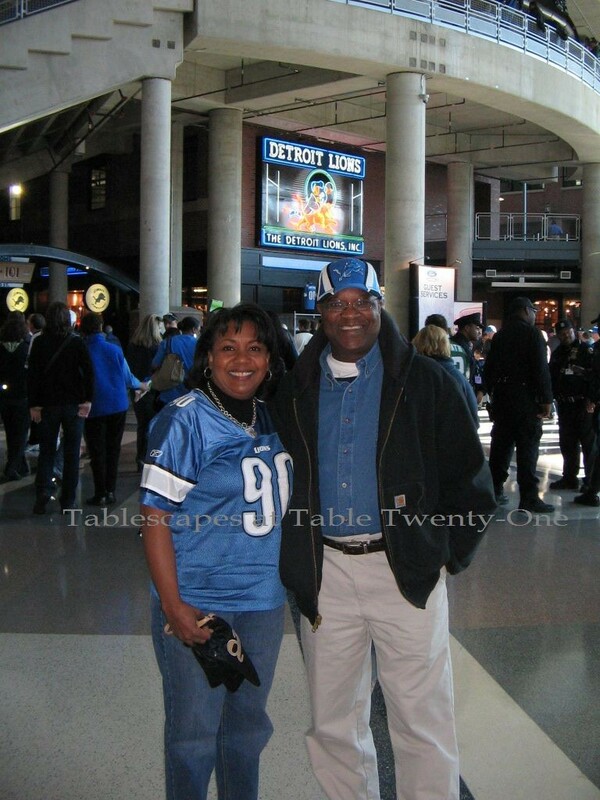 ), but thanks to our gracious hosts we have a special place in our hearts for the Motor City and home of the Lions! I am so happy to share my thoughtful friend’s creation with everyone who visits my blog and that of the Style Sisters’ Centerpiece Wednesday and Susan’s Tablescape Thursdays! Enjoy!!! So glad you got away and had a wonderful time. I know this family is very special to you. 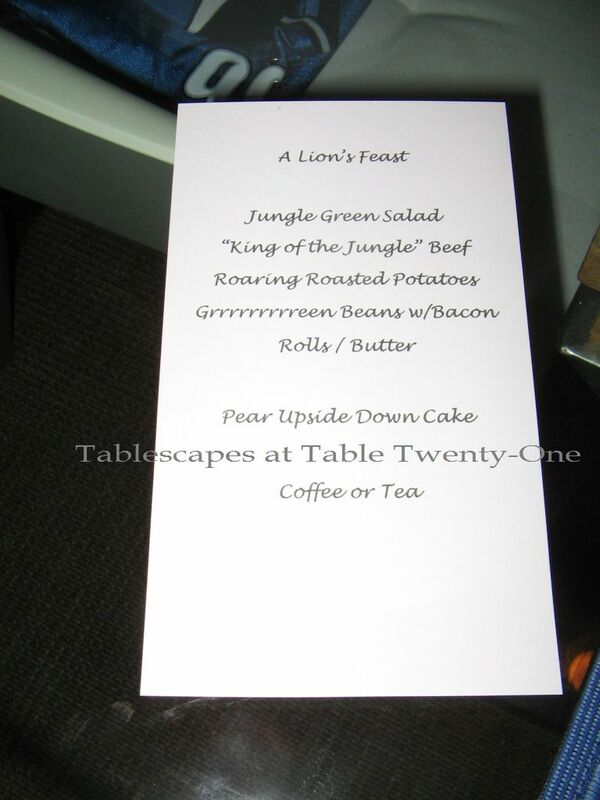 What a wonderful creative job Rene did with the Lions theme. She thought of everything! Brilliant! What a sweet friend you have! What would we do without our friends. I hope you have a better week and my thoughts are with you. Yay for you for flying!! 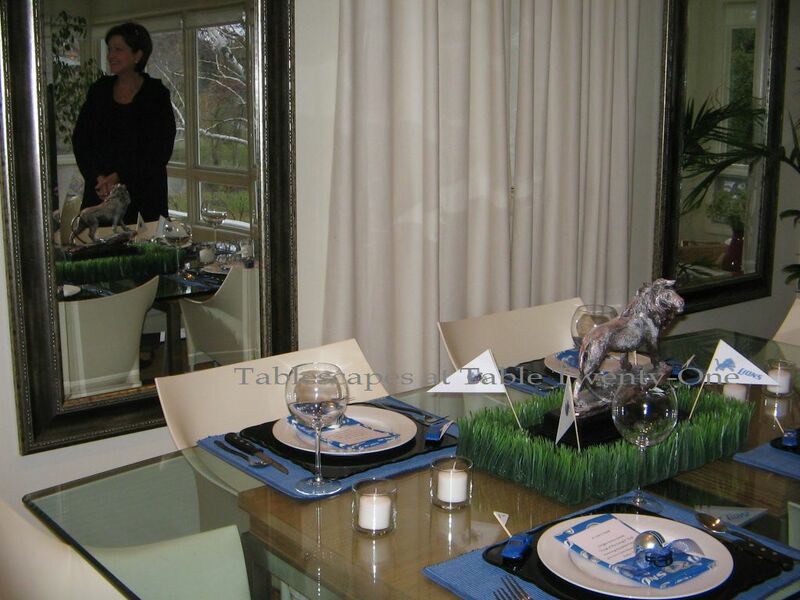 Rene presented you and Ramon with a lovely tablescape and meal. You are blessed to have such good friends. And, she’s creative as well! I love that! What a fantastic table (no pun intended!)! 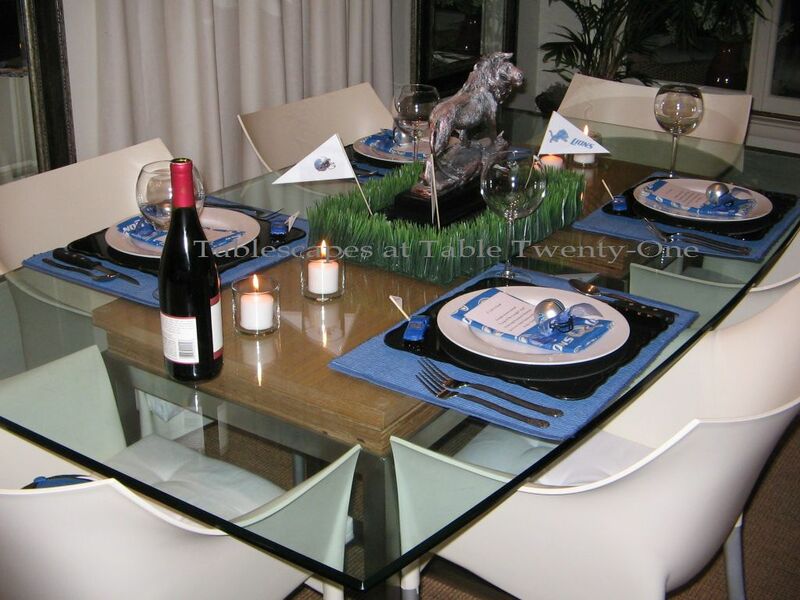 The table manages to be elegant AND sports-appropriate — no mean feat! Thanks for sharing! What a friend to put forth such effort on your behalf! She did a great job. BTW, did the Lions win? I’m with you on flying, but that is very courageous of you! Sounds like it was a great time!!! What a nice welcome…even if you had to fly. What a festive centerpiece – how nice of a dear friend to do that for you.